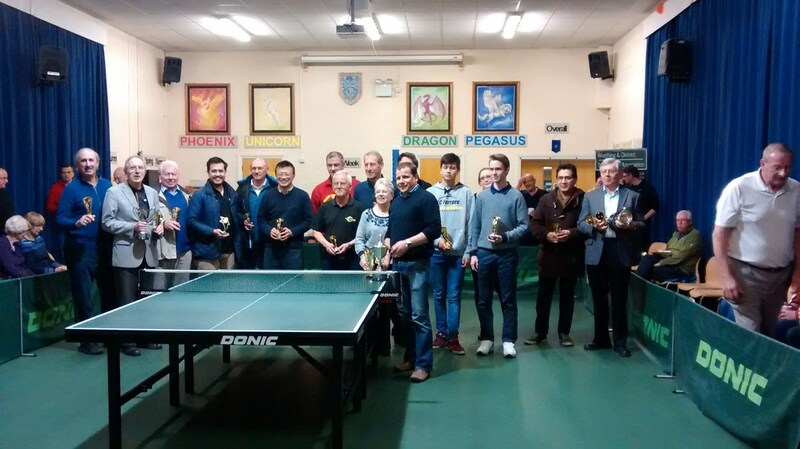 The end of season presentation of trophies took place at the Lancing Table Tennis Club on the 11th April. The winners out of the seven teams in Div.1 were Pavilion ‘A’ on 128 pts., with Woodlands ‘A’ coming second on 122 pts., and Lancing ‘B’ third on 100 pts. Top of the averages in the division was Stuart Burdock of Pavilion ‘A’ who won 29 out of 30 games played. Steyning ‘A’ were battling all season with Lancing ‘D’ at the top of Div.2 and came out winners on 122 pts. Lancing finished second on 115 pts., and Woodlands ‘E’ third on 99 pts. Top of the averages was William Moore of Steyning ‘B’ winning 42 out of 51 games played. West Chiltington went one better than last season by winning Div.3 with a very impressive 146 pts. Second were Steyning ‘C’ on 101 pts., and tied third on 91 pts. were Lancing ‘E’ and ‘F’. Top of the averages was Stuart Tofts of West Chiltington having won 36 out of 39 games played. West Worthing ‘B’ withdrew from Div.4 before the season got under way which left only five teams in the division. Pavilion ‘B’ took the title very comfortably on 123 pts. Lancing ‘G’ came second on 82 pts., and Woodlands ‘H’ third on 74 pts. Pavilion players were first and second in the averages, top being Annie Brotherton who won 23 out of 24 games played. The winner of the Jim Holden trophy for the most improved junior went to Louis Mort-Hill of Lancing ‘G’ who had a very good first season in the league finishing third in the Div.4 averages. Worthing and District Table Tennis League was founded in 1949 to promote the sport and administer league table tennis. We are affiliated to Table Tennis England and Sussex County Table Tennis Association. We support clubs in Lancing, Rustington, Steyning, West Chiltington and West Worthing areas. We welcome players of all standards and abilities and look foward to a great year of table tennis.